FLUVANNA COUNTY, Va. (WRIC) -- A Mechanicsville man has been arrested for setting a home on fire and trying to kill the people inside, the Fluvanna County Sheriff's Office says. Firefighters responded to a home on fire on Miles Jackson Road in Fluvanna County early Sunday morning. All three people in the home escaped without injuries. The blaze was put out, but the house is severely damaged. Investigators believe the fire was set intentionally. Deputies believe Cole Spencer Augustus Carter, 26, of Mechanicsville, set the house on fire. Investigators say Carter knew one of the people who lived in the home. 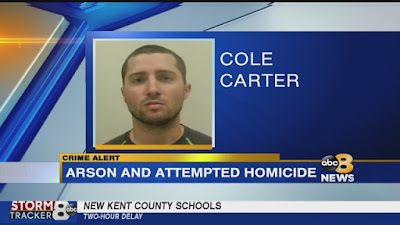 Carter was arrested and charged with arson and three counts of attempted homicide. He was also charged with violating a protective order and giving false information to law enforcement.